After a crazy start to the season, the Oklahoma City Thunder have now taken the top spot in the NBA at 20-4. With 28.6 points per game, Kevin Durant has a commanding grip on the number one scorer&apos;s spot, and Russell Westbrook is averaging another 21 points a night, which places him at number fifteen league-wide. The red-hot Thunder have won their last 7 games, and tonight they&apos;ll play host to the Chicago Bulls, who have hit a major road block with the absence of Derrick Rose. How&apos;s this for a coincidence? At this time last season, on December 19, 2012, the Thunder had the exact same record of 20-4. That night, they picked up a 100-92 road win against the Atlanta Hawks, advancing to 21-4. Kevin Durant was absolutely unstoppable, putting up 41 points, 13 rebounds, 3 assists, and 2 blocks. Meanwhile, Russell Westbrook chipped in another 27 points and 11 assists. Will Oklahoma City be able to repeat history and move to 21-4 again this year? Find out tonight. 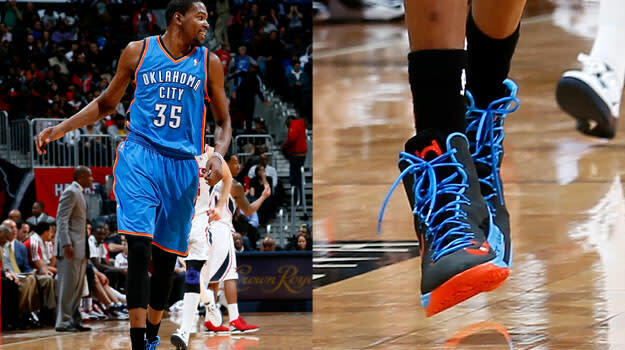 During this dominant performance and the rest of the 2012-13 season, Kevin Durant was laced in his fifth signature sneaker, the Nike KD V. Built with a Hyperfuse upper, forefoot Zoom Air, and heel Max Air cushioning, this Durant model featured a noticeably higher cut than the KD III and KD IV. It has since been discontinued, but you can pick up the Nike KD V Elite version today for $115.